Is my Mac's battery okay? This is what is says. I bought my Macbook in December 2008, do you think that this is normal for its age? I got a 15 in MacBook Pro in November 2008. My cycle count is at 1312 and the condition says normal. I think my battery life has fallen off a little bit, but it still is fine. I don't know how comparable our batteries are since we have different models, but given how many more cycles my battery has gone through, I'd say yours will be fine for a while. I agree with Joe. Your battery seems in good shape, considering it's age and number of load cycles. 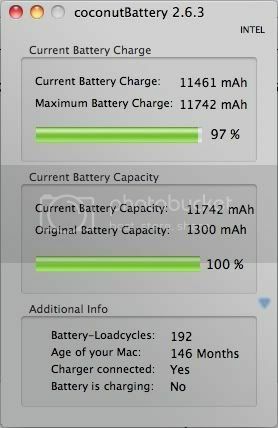 OTOH, the 'CoconutBattery' application that I use reports that my MBP is 146 months old. That's 12 YEARS! There weren't even MBP's back then!